But what if there is no differential backup, and there is a need to restore the database with the full and transaction log backups? To find out which transaction log backup should be restored right after the full backup is restored take a look at the LastLSN of the full backup and the FirstLSN and the LastLSN of the transaction log backup. 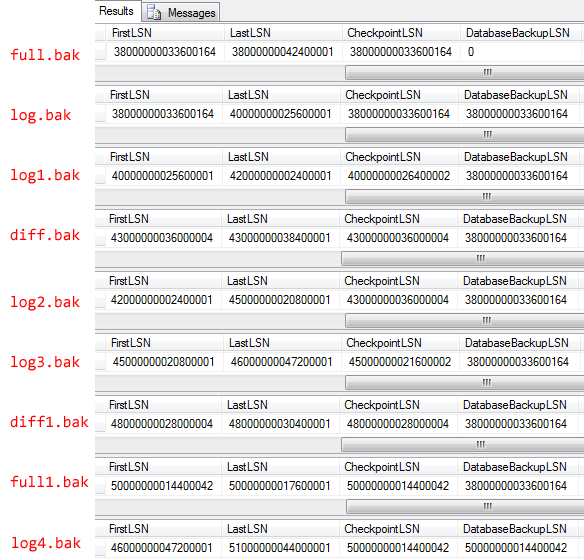 The LastLSN of the full backup should be between the FirstLSN and the LastLSN of the transaction log backup. Note that LastLSN value of the previous transaction log backup is equal to LSN of the first log record stored in the following transaction log backup, as shown on the picture above.